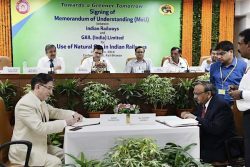 Indian Railways and GAIL (India) Limited have together taken a significant step towards expanding usage of natural gas as an environment-friendly fuel across all Indian Railways applications. The decision is complementary to the current determination by the Ministry of Railways to reduce use of diesel fuel and increase energy/fuel efficiency in its operation system, including conversions of Diesel Electric Multiple Units (DEMU) to natural gas. This historic partnership will pave the way for supply of Natural Gas to Railway workshops, integral coach factories, loco workshops, DEMU sheds, etc., located along the existing and upcoming pipeline networks of GAIL. A covering Memorandum of Understanding (MoU) was signed in the presence of Shri Ashwani Lohani, Chairman, Railway Board and Shri B C Tripathi, Chairman and Managing Director, GAIL, by Shri Gajendra Singh Director (Marketing) and Shri Chetram, Chief Administrative Officer Indian Railways. Along the prestigious 2540 km eastern India pipeline project inaugurated in October 2016 and currently under execution (known as ‘Pradhan Mantri Urja Ganga’) alone there is scope to supply natural gas to over 10 workshops of Indian Railways (IR). These workshops shall be connected to the expanding network in a phased manner. Railway Board Chairman Ashwani Lohani reportedly said that all 23 railway workshops would start using natural gas by December 31, 2018. Additional facilities and production units will commence using gas by mid 2019. GAIL describes the MoU between these two leading organisations of the country as a step towards fulfilling Central Government’s vision of developing a Gas-based economy in India and progress towards expanding the share of Natural Gas in the energy mix from 6.5 % to 15 %. This endeavour shall reduce carbon foot-prints of IR and contribute positively towards achieving COP21 commitments. Lohani said GAIL has informed the railways that it will help in reducing about 25 per cent of expenses on the fuel. According to the Railway Ministry officials, the use of natural gas has the potential to replace about 844,027 cubic meter of acetylene, 2,354,425 Kg of LPG and 140,991 Kg of BMCG (Bharat Metal Cutting Gas) and 5,500 KL of HSD/Furnace oil worth Rs 70 crore (USD 9.9 million) per annum. “The objective of this memorandum of understanding is, on a pan-India basis, wherever we have reach, we will be supplying natural gas to the Indian Railways,” said B.C. Tripathi, chairman of GAIL India. Furthermore, the rollout of natural gas infrastructure across large parts of India together with the connection of railway facilities to the natural gas network is likely to facilitate the further expansion and adoption of this lower-emission fuel as a driver of some of India’s almost 6,000 (IR Data: March 2016) diesel-powered locomotives.